I started off the day standing in the line at the fish market talking to the lady beside me. 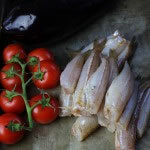 She was from the Croatian Coast near Dubrovnik and she just happened to be buying Whiting to fry. This took me back to boat trips on sunny days in Zadar where we ate fried fish just like this, and before I knew it I had a kilo wrapped and paid for. I cooked it with some other things in my kitchen. These caperberries were given to me as a gift by Charlie from www.hotlyspiced.com & were the perfect thing to have with my fried Whiting. Caperberries are the fruit of the caper bush. I love them and they went so well with my smoky puree of eggplant and chickpea that I seasoned up with this amazingly potent smoked salt. A couple of weeks ago I went to an open day at “Salt Meat and Cheese” in Alexandria, Sydney and met Rowena from www.thesaltbox.com.au. After I tasted her salts, I was very keen to cook with some, most especially the Smoked Applewood, and this is also in my dish. 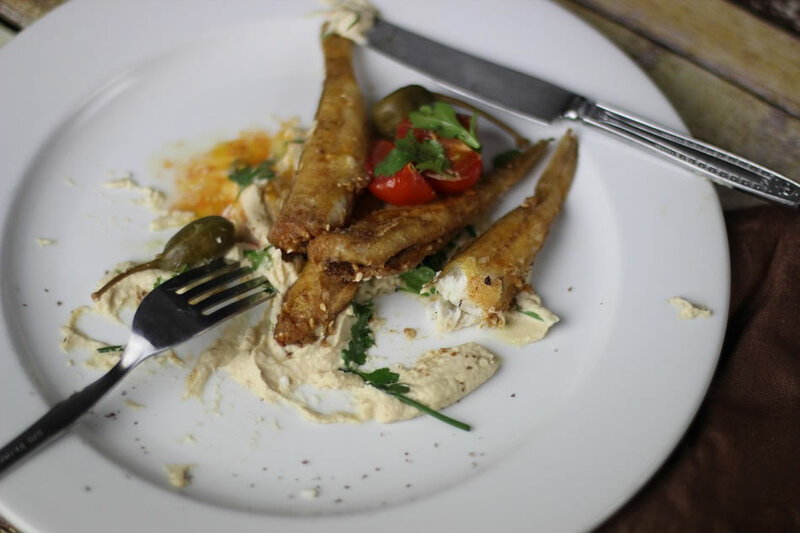 You can still make this dish without the smoked salt but I am telling you….you need some. The last and most delicious thing that is in my kitchen are some lovingly grown greens and vegetables that Celia and Pete (www.figjamandlimecordial.com) gave me when I visited them this week. Use any kind of white fish you like. If you prefer fillets then use these instead. This recipe uses Australian cup measurements. Put the eggplant over an open gas flame turning occasionally until the skin is charred. (Approx 10 minutes). Pop the eggplant into the oven for another 10 minutes until very soft . This can be done under the grill too. Dry the fish. Mix all of the dry ingredients (flour, 4 ta cumin and 1 T smoked salt) in a container and toss the fish till coated. 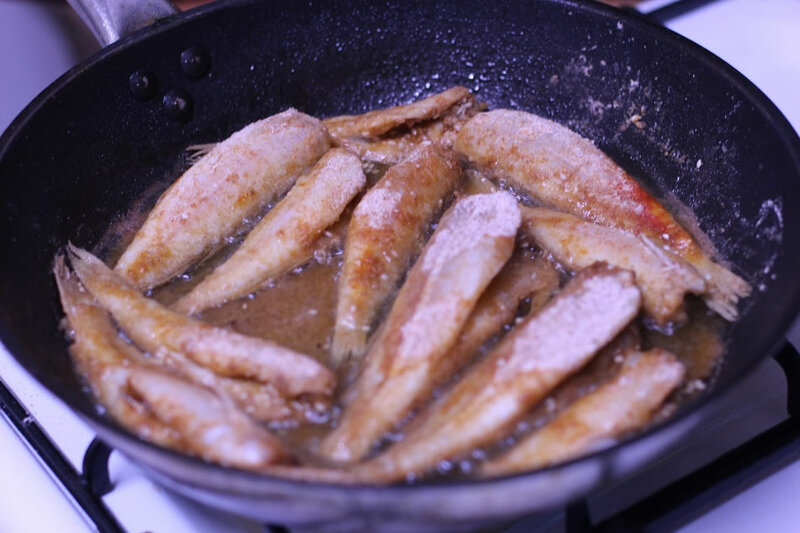 Preheat the oil and fry the fish on high till brown and crispy. Drain on absorbent paper. Disclosure: I was sent Smoked Applewood salt by www.thesaltbox.com.au, however I have included it in this post because it is very good. This sounds like a terrific meal. I brought back some smoked salt from Maine…perfect timing. Love the recipe for the eggplant hummus- I use eggplant in baba ganouj- but not in hummus- this sounds delish! 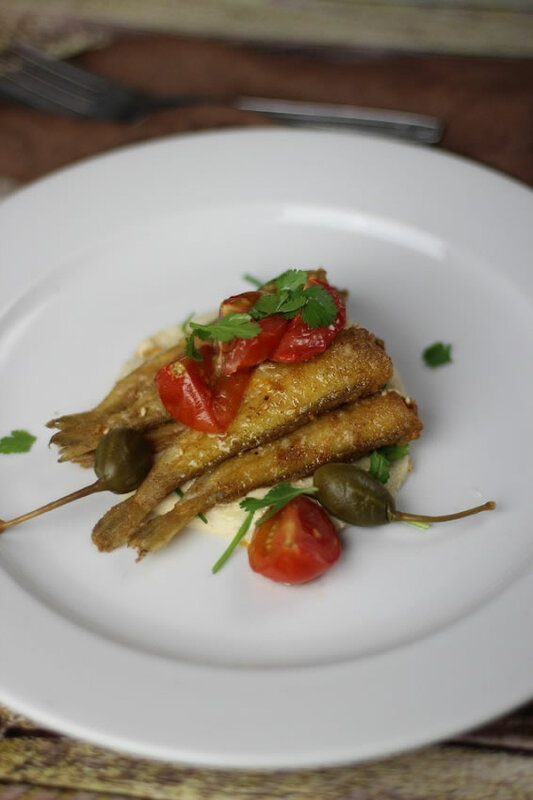 I grew up eating fried whiting-but haven’t eaten it in years! Love the combination and especially the smoky eggplant puree which I’ll copy soonest! Am more a fish griller than a frier . . . but the dish would still taste great. Hardly use any salt bar what one finds in some of the Asian sauces, but that apple wood one surely seems most interesting!! I’m so jealous of your Celia-grown produce! Yummy! 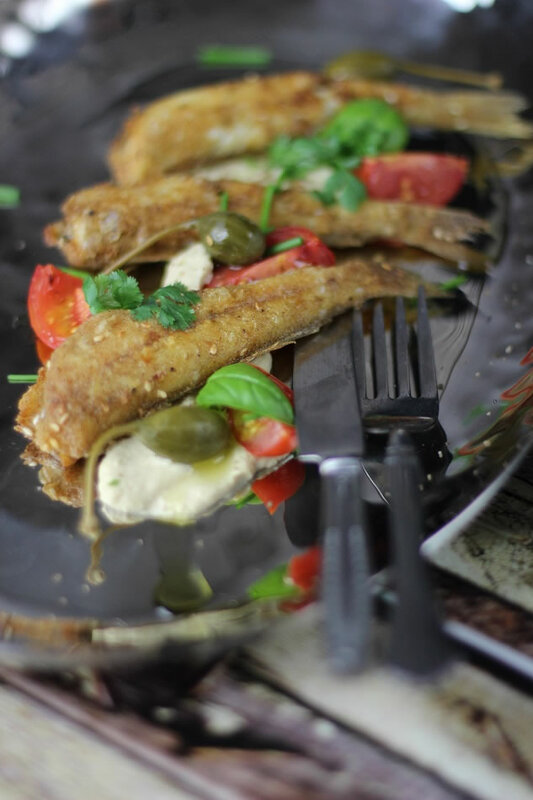 Love whiting… had not thought of combining it with eggplant, but definitely want to try this. Thanks Tania for sharing. G’day Tania!! Thank you for this month’s kitchen view! Thank you for also allowing me to learn something new re your Yakima…your dish looks lovely too! Your meal looks wonderful! I love the fishmarket chat along the way too. This is the meal I would thoroughly enjoy! I love that eggplant puree too. 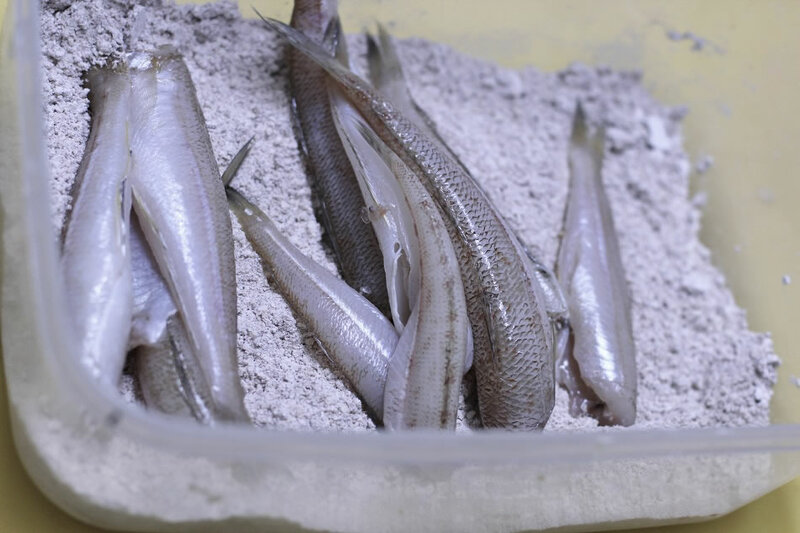 my father-in-law used to go on an annual fishing trip with some friends – on the last one they caught about 400 whiting (of the legal size) that were all gutted and filleted by them – sooo good! I’ve not eaten them in ages – must do so. Love the idea of the “hombaba”-Nice combination of flavours & textures. Whitings are the most delicate fish I’ve tasted along with the red mullets. Mouthwatering recipe! That first photo looks pretty enticing! 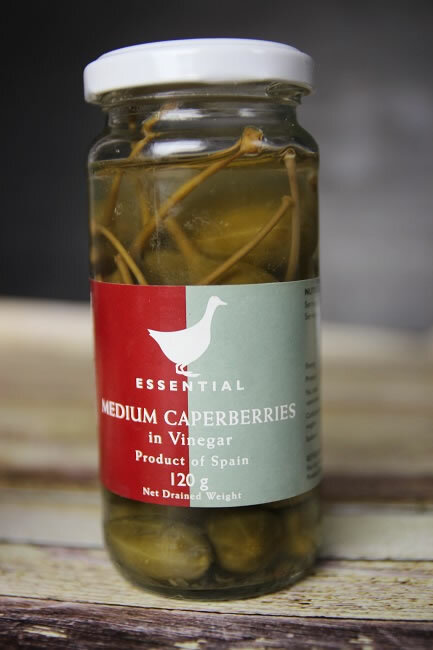 I love whiting, and I love caperberries – such great texture! Your fish looks like it is cooked to absolute perfection, gorgeous! 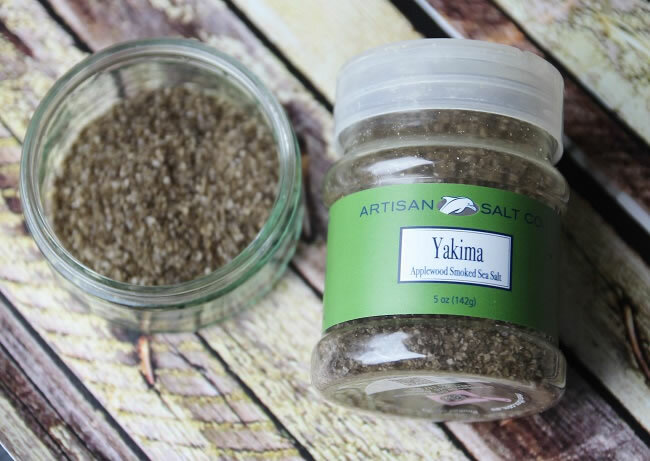 Glad you enjoyed the Yakima Applewood salt….I am now going to try your recipe! We have a few smoked salts all with unique flavours – Applewood, Fumee de Sel (Chardonnay Oak Smoked), Alderwood Smoked, Hickory Smoked and the big daddy of them all, Extra Smoked with 7 different woods. I love hearing how other people use them!. thx. My mum lives in Adelaide and her partner is Greek meaning most of their fresh produce comes via a process of bartering and exchanging amongst friends in the wider Greek community. 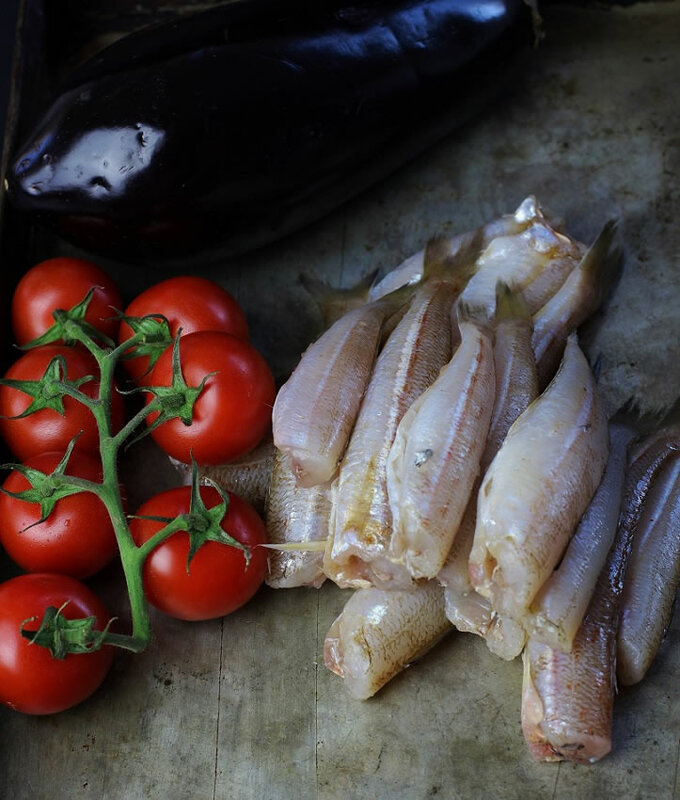 At any time of the year you can guarantee one thing that they have stocked up is fresh whiting. Every two weeks they get a batch from a friend with a boat, spend the Sunday gutting and filleting it; and then the rest of the week devouring it. I swear they have nearly turned into a whiting! caperberries! that is the first time i have heard them called that! i love them but my partner doesn’t so it is always a battle whether to cook with them or not! Tania, your fish dinner is exquisite and the memories it evoked were special, too. I’ve never seen caperberries so large! The ones available here aren’t much bigger than a peppercorn… will have to do some sourcing. (Love capers!) 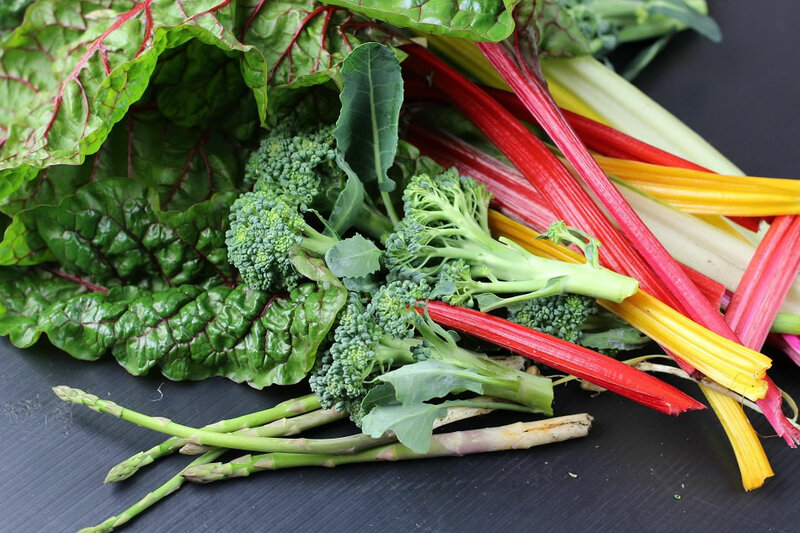 You put together a beautiful dish and a lovely post! Now THIS is a dish for me! I love eggplants and anything smoked so smoky eggplants and smoky salt? Winning combo. Thanks for the ideas and the tour.